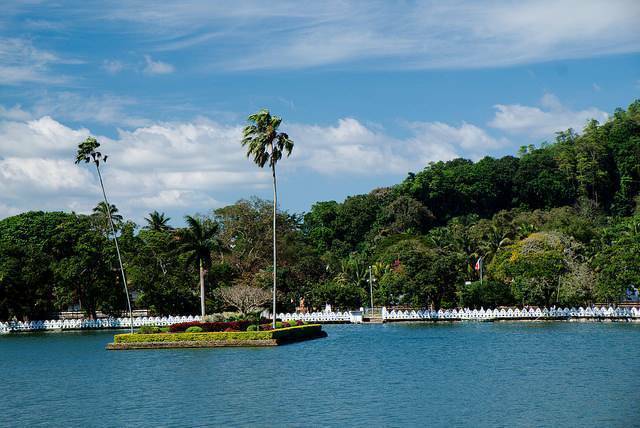 Kandy Lake is an artificial lake which was built by the last King of Sri Lanka and of Kandy, Wikarama Rajasinhe. It was originally built to beautify the Temple of the Tooth and serves as a remnant of the last Sri Lankan Kingdome. This lake is also called “Kiri Muhuda” which means Milky Ocean. This lake has an unfinished wall called the Valakulu Bamma, meaning cloud walls. The unfinished wall has a history attached to it which makes it even more interesting. It remains incomplete due to the arrest and subsequent arrest of the King Wikrama in 1815 by the Britishers. Standing at 2060 feet, the cloud wall remains unfinished even today. The triangular holes in the walls are used to light oil lamps. When the lake was built, a dam was built across the lake which was later destroyed from both ends leaving an island shaped structure in the middle. This structure remains today and serves as an island in the middle of the lake which only adds to its beauty. There is a legend which says that this island was once used by the King for bathing and was connected to the palace through a secret tunnel. The lake has considerably reduced during the years due to several factors and thus several prohibitions have been laid down for its protection; prohibition of fishing at this lake being one of them. This lake is basically built on paddy fields and thus requires extra protection. This place deserves a visit for its legendary stories and the man- made characteristics which add to the awe of this place!